Wherever you are, and whatever you may be doing, be safe, have fun, and Happy New Year! I know, I know ... I hardly update this thing, but, if you happen to be reading this, Merry Christmas! Hell, even if you're not reading this, Merry Christmas, too! Note from Ric: Look at the cute dawggiez! ARLINGTON, Texas, Sept. 13, 2016 -- WWE fans can now share their passion with their pets as Petmate, the worldwide leader of solutions and excellence in the pet industry providing fun trusted, quality products to enhance the lives of pets and their families, announces the launch of its new collection of WWE pet products available at retailers nationwide. The new collection features iconic pet beds, fan favorite collars and leashes, and assorted rough and tough rubber and plush toys, capturing the excitement of WWE. 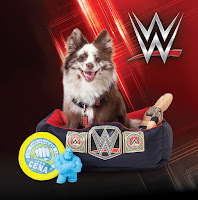 Showcasing the brand's mega-themes and fan-favorite Superstars including WWE Superstars John Cena and The Rock, and WWE Hall of Famer Stone Cold Steve Austin, the collection is now on pet store shelves near you and online at PetSmart.com, Amazon.com and Walmart.com. For more information visit Petmate.com. "There are more than 68 million American families devoted to their pets and you can count WWE fans among those passionate pet lovers," said Chris Wilson, executive vice president of marketing and new product development for Petmate. "The Superstars and iconic symbols of WWE translate extremely well into these new innovative quality pet products that appeal to all fans." 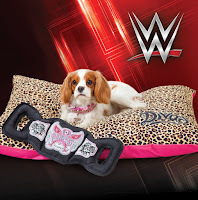 WWE Superstars are brought to life with printed canvas and rugged rubber chew toys. Designed for tough tug play between you and your dog, or for two dogs to wrestle and tug together. 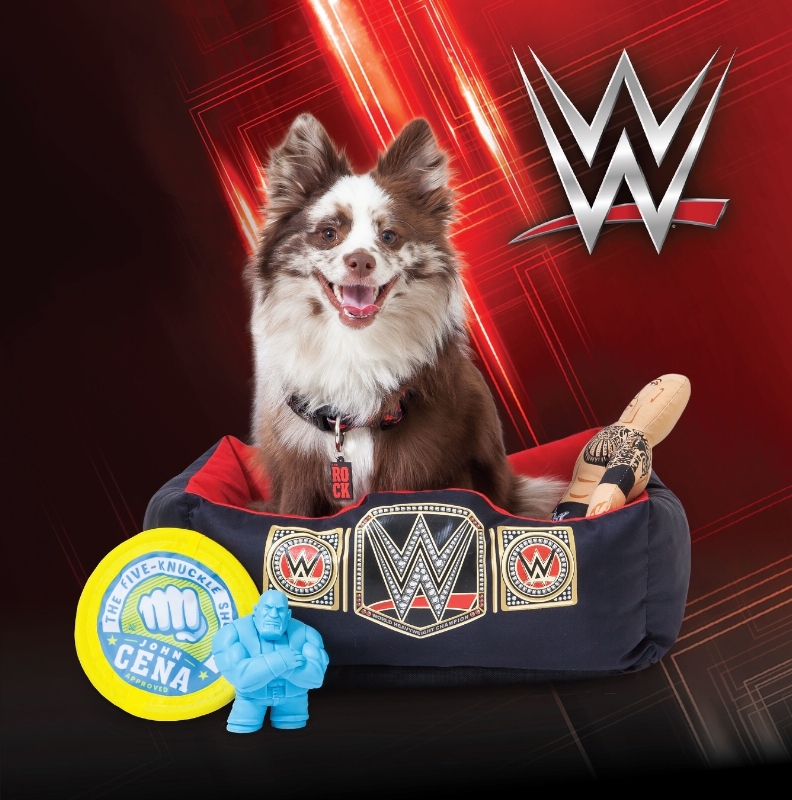 The WWE World Heavyweight Championship makes an appearance in the shape of a rectangular lounger for your pet to enjoy after a hard day of play. Other pillow beds and loungers feature The Rock, the iconic WWE logo and Divas leopard print. A wide variety of bedding styles for dogs of all sizes who want to feel like a true Superstar. WWE collars and leashes feature custom Superstar prints showcasing WWE favorites, such as John Cena, The Rock and Stone Cold Steve Austin. These adjustable dog collars are soft and durable, and feature patterns from your favorite WWE Superstars. Leashes feature custom fan favorite Superstar patterns and coordinate to match WWE adjustable collars. Founded in 1963, and headquartered in Arlington, Texas, Petmate is passionate about providing fun, trusted quality products worldwide to enhance the lives of pets and their families. The company's vision, to be the worldwide leader of solutions and excellence in the pet industry, encapsulates its commitment to deliver award-winning, innovative ideas daily to each of its product categories including bedding, kennels, dog houses, feeding and watering products, litter maintenance products, toys, collars, leads and travel. Petmate's portfolio of pet, family-favorite brands include Aspen Pet®, Chuckit!®, Dogzilla®, Jackson Galaxy®, JW®, MuttNation™ Fueled by Miranda Lambert and WWE®. For more information, visit www.petmate.com. Bellator has been informed of a terrible accident that occurred last night involving featherweight fighter Jordan Parsons, who was struck by a vehicle in a hit-and-run incident. We are still in the process of uncovering details and with his family’s consent, hope to have an update on his medical condition soon. Our thoughts and prayers are with Jordan and his family as he recovers. The hit-and-run occurred on Lindell Blvd. and South Federal Highway in Delray Beach, Florida. Anyone with information regarding this incident is asked to call the Delray Beach Police Department at (561) 243-7800. Sounds like quite the winner, doesn't it? TORONTO, March 19, 2016 - URSHOW.tv announces UR FIGHT changes and a hotly anticipated ballin' performance by RiFF RAFF. American Rapper and viral sensation, has kept his fans buzzin` about when his next album will drop but now he brings an adrenaline pumpin', sonic performance to the Celebrity Theatre in Phoenix, Arizona this Sunday March 20th. Now a high roller unto himself he is sure to bring this spectacle to a whole other level. On the MMA front, Tank Abbott was forced to withdraw from the eagerly awaited fight with Dan Severn this week live in Phoenix, Arizona. As a replacement, Shannon "The Cannon" Ritch will step in and square off against Mavrick Harvey. A quadruple main event like you've never seen including Roy Jones Jr., Rey Mysterio, Michael Bisping and Chael Sonnen, now brings The Cannon and Mavrick into the limelight and gives them their chance to go head to head. Live venue and iPPV tickets now available. - Justin Roberts, best known for his work with WWE and a ``born entertainer``. For those looking to catch UR Fight in person, visit the Celebrity Theatre Website and Box Office today. Tickets are priced at $40, $60 and $100 respectively. The Live Stream iPPV, broadcast only on URSHOW.tv, is also now available directly from our website for only $11.99US. To stay up to date on the latest exclusive celebrity content and the most epic live events, visit URSHOW.tv for more information. URSHOW.tv is a new digital television network of celebrity channels that will bring U exclusive programs on-demand and incredible live events streamed directly to you. Watch from any device you choose, no matter where you are in the world. Amazing features give you an unprecedented level of interaction with your favorite stars. Connect with celebrities like never before, gain behind the scenes access, shape the experience and be a part of URSHOW.tv. Houston, TX, (February 18, 2016) – Scott Coker, President of Bellator MMA and one of combat sport's most accomplished promoters, will launch “Bellator Kickboxing” this April with his partners at Spike. The announcement was made today at a press conference ahead of "Bellator 149: Shamrock vs. Gracie," which airs tomorrow night on Spike at 9e/8c. Bellator Kickboxing will feature many of the world’s best kickboxers including Joe Schilling, Raymond Daniels, Kevin Ross, Keri Melendez and Anastasia Yankova, who were in attendance at today’s press conference. The current Bellator MMA team based out of Santa Monica, CA will run the new league. The first event for Bellator Kickboxing will be a co-promoted show with Bellator MMA and Oktagon Kickboxing on April 16 at the Pala Alpitour in Torino, Italy. The Bellator Kickboxing event's headliner will feature Melvin Manhoef vs. Alexandru Negrea as well as a 5-round title fight when current ISKA 72kg champion Mustapha Haida will move up in weight to challenge Karim Ghajii for his ISKA 75 KG belt. Other participants competing at the inaugural Bellator Kickboxing extravaganza include Ross, Daniels and Denise Kielholtz. Opponents for these participants will be announced in the near future. The event will also include "Bellator 152," a mixed martial arts card will feature Alessio Sakara vs. Brian Rogers, and also features Bellator MMA stars Patricky “Pitbull” Freire, Brent Primus, Anastasia Yankova and A.J. McKee. Bellator Kickboxing’s debut event will air on Spike Saturday, April 16 at 9:00pm ET/PT on brief tape delay. Earlier that day, Spike will broadcast Bellator MMA’s first international show, "Bellator 152," LIVE at 3:00pm ET. Details on future events will be announced in the near future. Following an amicable agreement to settle the litigation between the two parties, the always entertaining and exciting Quinton “Rampage” Jackson is returning to Bellator. Bellator MMA is thrilled to have “Rampage,” one of the most recognizable fighters in the history of the sport, joining a very competitive light heavyweight division featuring champion Liam McGeary, Phil Davis, King Mo, Tito Ortiz, Emanuel Newton, Linton Vassell among others. I've been fairly quiet on the Jackson/Bellator contract dispute, but this outcome sure seems to lend credence to my opinion that the UFC wasn't as interested in Jackson as they were in using him to "prove that the UFC isn't a monopoly." As most of you already know, yesterday, Axl Rotten was found dead. At this time, I don't want to judge Axl's personal life, his career choices, or the way he came to pass. I do, however, want to sincerely thank Axl, because were it not for him, I can't imagine how drastically different my life would be. To shorten a long story, Axl not only got me started in pro wrestling, he literally made it possible for me to eventually make a living covering the sport. Axl was a friend and a mentor, and, though I've shown my gratitude to him many times, one more time certainly can't hurt. Axl, may you find the peace in death that you never seemed to find in life. BALTIMORE, Jan. 25, 2016 -- Under Armour (NYSE: UA) today announced a global partnership with the dynamic actor, producer and global superstar Dwayne "The Rock" Johnson. As part of the long-term partnership, Johnson will work hand-in-hand with the innovative performance brand to create a range of products across footwear, apparel and accessories as well as support Under Armour's Connected Fitness initiatives. This multi-faceted partnership will include the collaborative development of original content, inspired by the actor's lifestyle, fitness regimen, and philanthropic initiatives. Johnson will play an integral role in the promotion of Under Armour's Connected Fitness platforms including the recently debuted Under Armour HealthBox™ and Record™ application. Additionally, the brand will develop product capsules including footwear, apparel and accessories inspired by the films Johnson is currently working on. The first product capsule will feature a Rock-inspired backpack and duffle bag that will launch on UA.com and be available in select Brand Houses in the next few weeks. Under Armour will also enroll Johnson to help support and drive awareness around the brand's philanthropic initiative, UA Freedom, developed to inspire, honor and support members of the United States Military, first responders and public safety officials. Following a career in the WWE that includes seven WWE Championships, Johnson has solidified himself as a worldwide box-office powerhouse, ranking number one on Forbes's Top Grossing Actors of 2013 and being named the Top International Box Office Star for 2015. On the heels of his success in 2015, Johnson will be starring in the highly anticipated Central Intelligence this year and is currently in production of the second season of the critically acclaimed "Ballers" on HBO, for which he received a 2016 People's Choice Award for Favorite Premium Cable TV Actor. Throughout his successful career, Johnson has remained dedicated to promoting health and fitness, with a continued mission to educate, empower and motivate people around the world through health and physical fitness. "We wanted to empower as many people as possible to attack their goals, so we partnered with the best innovators in the health and fitness business. Together with Under Armour, we will deliver game changing products to help people get after it and chase greatness," said Johnson. "Dwayne has been a key partner to the Under Armour brand for many years and a key contributor to sports and entertainment as a whole. We are thrilled to have him officially join the UA Team. His values and commitment to health and fitness directly align with Under Armour's brand mission to make all athletes better and we look forward to working with him for many years to come," said Todd Montesano, Senior Vice President Strategic Partnerships and Entertainment. Johnson joins Under Armour's all-star roster that includes Stephen Curry, Tom Brady, Cam Newton, Misty Copeland, Jordan Spieth, Lindsey Vonn, Andy Murray and Michael Phelps. Follow Dwayne on Under Armour's connected Fitness app UA Record™ to check out his workouts and get exclusive training tips and content. You can also follow him @TheRock on Facebook, Twitter and Instagram and follow Under Armour on Facebook, Twitter and Instagram @UnderArmour. Under Armour (NYSE: UA), the originator of performance footwear, apparel and equipment, revolutionized how athletes across the world dress. Designed to make all athletes better, the brand's innovative products are sold worldwide to athletes at all levels. The Under Armour Connected Fitness™ platform powers the world's largest digital health and fitness community through a suite of applications: UA Record, MapMyFitness, Endomondo and MyFitnessPal. The Under Armour global headquarters is in Baltimore, Maryland. For further information, please visit the Company's website at www.uabiz.com. NEW YORK, Jan. 5, 2016 -- The most fierce violence ever waged in and out of the ring involving wrestling's most ruthless combatants (men and women) is now available for home and mobile viewing. This controversial content is seen on iNDemand Networks, Vubiquity Network, DIRECTV and Shaw Cable Canada. The rage and depraved behavior is equivalent within the sexes. Whether the executioners are men or women, their cutthroat actions prove they are out for the kill. Laws do not apply to these confrontations as both sexes vow to take any action needed, legal or illegal to come out victorious. Bloodshed, criminal brutality and moral disregard separate those who reign victorious and those who go to the morgue. INdemand affiliates include: Comcast, Time Warner, Cox Cable, RCN, Cablevision, Brighthouse, Mid-Continent and many others. Vubiquity's affiliates include: Charter Communications, Verizon FiOS, and many more. REDWOOD CITY, Calif., Jan 6, 2015 -- Electronic Arts Inc. (NASDAQ:EA) today announced EA SPORTS™ UFC® 2 launches on March 15, 2016 in North America, and March 17, 2016 worldwide. In addition to the announcement, EA released a cinematic trailer for EA SPORTS UFC 2 featuring some of the biggest moments from recent bouts, showcasing authentic gameplay features, and highlighting new character visuals and signature animations. The trailer opens on EA SPORTS UFC 2 cover athlete and UFC® featherweight champion, Conor McGregor showing fans the all-new Knockout Physics System in his championship fight at UFC® 194. From there, fans will see Dynamic Grappling, and Next-Level Submissions while reliving some of the heart-stopping moments from recent fights, and speculating what could happen in upcoming contests. Watch the trailer here. Fans excited to step into the Octagon® can pre-order EA SPORTS UFC 2 and get day one access to two legendary fighters: UFC Hall of Famer and three-time King of Pancrase, Bas Rutten; and Japanese MMA legend, “The Gracie Hunter” Kazushi Sakuraba, with an additional mystery fighter who will be named later. * The deluxe edition of the game also includes up to $60 of UFC Ultimate Team™ Premium Packs**. For pre-order information, visit http://easports.com/UFC/buy. EA SPORTS UFC 2 is headlined by five brand new game modes including KO Mode and UFC Ultimate Team, a revamped Career Mode that lets fans create female fighters for the first time ever in an official UFC game, and Grapple Assist, an integrated visual tool to help players learn and perfect takedowns, ground game transitions, and submissions. Full feature and mode details can be found at http://easports.com/ufc/features. * Internet connection and EA Account required. Must be 13+ to create an account. Offer restrictions apply. Please see www.easports.com/ufc/game-and-offer-disclaimers for details. **ADDED VALUE CALCULATED BASED ON AN UFC ULTIMATE TEAM PACK PRICE OF $2.00 AT GAME LAUNCH. PRICES MAY CHANGE. Offer restrictions apply. Please see www.easports.com/ufc/game-and-offer-disclaimers for details. EA SPORTS UFC 2 is developed in Burnaby, British Columbia by EA Canada, and will be available on March 15 in North America and March 17 worldwide on Xbox One and PlayStation®4. More information is available on the EA SPORTS UFC website, and in-depth feature details will be announced in the months leading up to launch. Fans should keep an eye on the website, as well as the EA SPORTS UFC Facebook and Twitter pages to make sure they’re always up-to-date on the latest and greatest news. EA SPORTS, Ultimate Team, SSX, The Sims, Dragon Age, Plants vs. Zombies and Battlefield are trademarks of Electronic Arts Inc. and its subsidiaries. Ultimate Fighting Championship®, Ultimate Fighting®, UFC®, The Ultimate Fighter®, Octagon Girls®, Submission®, As Real As It Gets®, Zuffa®,The Octagon™ and the eight-sided competition mat and cage design are registered trademarks, trademarks, trade dress or service marks owned exclusively by Zuffa, LLC and affiliated entities in the United States and other jurisdictions. All other marks referenced herein may be the property of Zuffa, LLC or other respective owners. Any use of the preceding copyrighted program, trademarks, trade dress, or other intellectual property owned by Zuffa, LLC is strictly prohibited without the express written consent of Zuffa. All rights are hereby expressly reserved. John Madden, NFL, NHL, NBA, PGA TOUR and FIFA are the property of their respective owners and used with permission. Xbox is a trademark of the Microsoft group of companies. "PlayStation" is a registered trademark of Sony Computer Entertainment Inc.
UFC® is the premier mixed martial arts (MMA) organization and largest pay-per-view event provider in the world. Headquartered in Las Vegas with offices in London, Toronto, Singapore and Sao Paulo, UFC produces more than 40 live events annually that consistently sell out some of the most prestigious arenas around the globe. UFC programming is broadcast in 158 countries and territories to over 1 billion TV households worldwide in 21 different languages. The UFC has a multi-year broadcast agreement with FOX in the U.S., which annually includes four live events broadcast on the FOX network, as well as The Ultimate Fighter® reality television show and thousands of hours of programming on FOX Sports 1 and FOX Sports 2. In 2014, UFC launched UFC FIGHT PASS®, a digital subscription service that is available throughout the world with exclusive live events, thousands of fights on-demand and original content. The UFC organization also licenses over 100 UFC GYM® locations, and owns UFC.TV® (offering live event broadcasts and video on-demand around the world), UFC FIT® (an in-home fitness and nutrition program), UFC Magazine, and has a videogame franchise with EA SPORTS, UFC Fight Club®, UFC Fan Expo®, UFC branded apparel, DVDs and Blu-rays and Topps Trading Cards. For more information, visit UFC.com and follow UFC at Facebook.com/UFC, Twitter and Instagram: @UFC.